There’s nothing new about staying in a monastery or convent. Monks and nuns have been offering refuge to travellers for centuries. But these days it’s not just pilgrims resting their weary legs. Visitors are more likely to be tourists on a tight budget or wanting to spend the night in a historic building in a spectacular setting. In Venice, for example, the 16th-century San Giorgio Maggiore monastery has views of St Marks that a hotel would charge a premium for – yet the monks ask visitors to simply pay what they can. Here are five of the best monasteries close to the capital but far from the crowds at Saint Peter’s Square. This tiny sanctuary 35km north of Rome, is in the wooded Monte Soratte nature reserve. In the fourth century, Pope Sylvester I is believed to have cured Emperor Constantine of leprosy on this hill, before converting him to Christianity. There’s no road access to the sanctuary, an old stone cottage painted yellow and orange; the way in is on foot from picturesque Sant’Oreste village along a steep path through purplish rocks riddled with caves where hermits once took refuge. The monastery is now home to just a few monks, and there’s no Wi-Fi or mobile coverage. At dawn visitors are woken and taken to the 691-metre summit of Monte Soratte to admire the 360-degree view stretching all the way to the sea. Silence is broken only by the cries of eagles and falcons. Monastery rooms are simple, with single beds and stone walls. From the tiny wooden-framed windows the dark green of the river Tiber can be seen, snaking across the valley. Breakfast might include strawberry tarts and freshly baked torta della nonna (grandma’s cake), a custard tart with pine nuts. A three-course dinner might include bruschetta, pasta with porcini mushrooms or wild boar ragù, followed by grilled chicken or pork. Monks on this large estate 50km north of Rome grow the fruit and vegetables used in the kitchens, and offer beds for 120 guests. Breakfast can include plums called coscia di monaca (nun’s thigh) because of their elongated shape, and pane degli angeli (angel food cake). Products to look out for are handmade soaps, shampoos, body creams, cosmetics and the “abbot’s aftershave”, all made with herbs and spices grown on site. There’s no TV or radio but there is a pine forest to stroll in and a “garden of silence”. Double and triple rooms all have single beds. 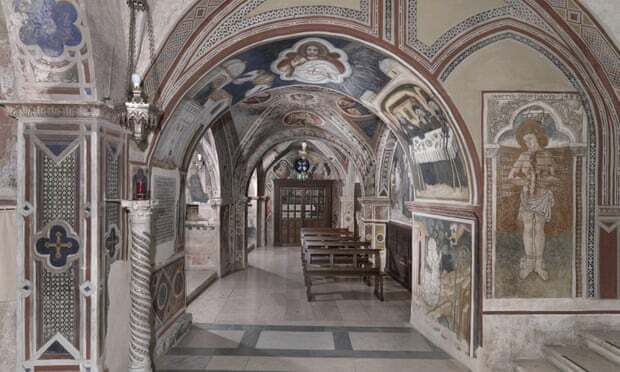 Carved into a mountainside, this Benedictine monastery 60km east of Rome follows the rule that guests should be welcomed “as if Christ himself were knocking on the door”. Visitors are welcome to share prayer time and mass with the monks, and speciality dishes in the refectory often feature tagliolini alla norcina (pasta with truffles) and beef fillet in mushroom sauce. The brothers at the apothecary store sell all sorts of medicines made using old remedies for liver pains, dandruff or high blood pressure. There is a medieval library with ancient texts but also modern amenities including a communal TV, and a bar where light alcohol drinks such as Aperol and Campari are served. The vaulted rooms are all en suite, with telephones, frescoed ceilings and views of the cloister or down the rocky precipice. At breakfast, enjoy cornetti (Italian croissants with cream and honey) and a selection of herbal teas. Around 100km south-east of Rome, this abbey has Roman columns, ruins of pagan temples, sarcophagi and a network of medieval chapels amid orchards, gardens of exotic flowers and palms. Enclosed by thick stone walls, this is one of the largest abbeys south of Rome,and has marble floors and views of lush gardens and ancient Roman architecture. During the day the brothers work their plots of land, growing plants and healing herbs. Their honeys – including orange, chestnut and mulberry varieties – are served at breakfast. There’s also an archaeological museum and a liqueur boutique where monks in brown robes and sandals chat with visitors about their fine herb liqueurs, artisan beers and grappas. Don’t expect a recipe though – that’s something the brothers are not prepared to share. Both monks and nuns live in this abbey 50km north-west of Rome (in separate areas, of course). Male guests sleep inside the monastery with the friars; women are welcomed in eight rooms next door, and at the adjacent convent run by Santa Brigida nuns. The cells have small beds, old wooden furniture including prayer stools, and views of the ancient bell tower and a maze of cobbled alleys surrounded by thick vegetation. The scenery is superb: green palms mingle with lemon orchards and rose shrubs. Handmade almond biscuits and coconut muffins are among the breakfast treats. Hymns and prayers can be heard all day, as guests sit under the shade of a gigantic oak tree. A small herbalist shop sells products such as ginger biscuits, vinegar, honey, chilli jam, cough syrups and devil’s claw healing cream – great for aching bones. There are even lessons available in Gregorian chanting.